Hello Guys, Code 2 Learn starts off its Python Tutorial. Like Java, C++, C etc, Python is also a Programming Language. Python is a general-purpose, high-level programming language whose design philosophy emphasizes code readability. IPython can be used as a replacement for the standard Python shell, or it can be used as a complete working environment for scientific computing (like Matlab or Mathematica) when paired with the standard Python scientific and numerical tools. It supports dynamic object introspections, numbered input/output prompts, a macro system, session logging, session restoring, complete system shell access, verbose and colored traceback reports, auto-parentheses, auto-quoting, and is embeddable in other Python programs.To install this package in Ubuntu. 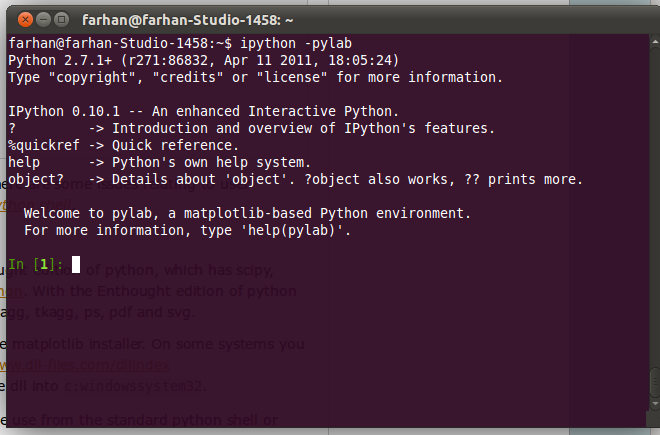 After the installation is successful, let install Pylab which will help us to give the MATLAB like properties in Python.